BMW's flagship model, the 7 Series, has just received a midlife facelift with some noteworthy updates. Apart from the cosmetic changes on the exterior, there are several revisions under the skin and on the inside too. And of course, it comes packed with even more high-tech features that it has always been known for. The BMW 7 Series is a long-time traditional rival of the Mercedes-Benz S-Class, and is back in the battle carrying more in its armoury. The biggest market in the world for the 7 Series is China, and BMW quite candidly says that all the changes have been made keeping in mind the preferences of their Chinese customers. Apparently, the Chinese like it to be known they are driving a BMW. And one with lots of attention drawing potential, is definitely an appealing attraction for them. 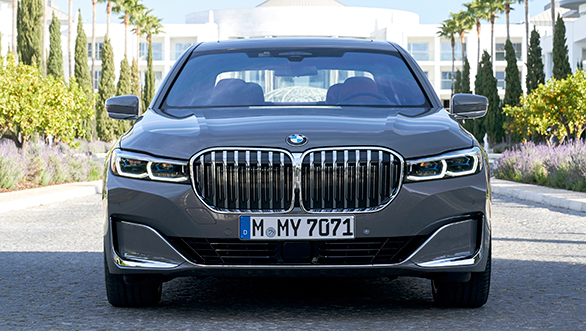 So the new 7 Series, like the new BMW X7, also has a much larger dual kidney signature grille. One that has grown 47 per cent in size compared to the one on its predecessor! To accommodate it, the bonnet has been raised, as have the fenders, and now the front end is 50mm taller at its foremost point, giving the new BMW 7 Series some additional brawn and muscle. The bonnet does not slope down as much as before and has more prominently cut lines and contours, and the diameter of the BMW badge on it has grown from 82 to 95 mm too. The new larger grille is flanked by thinner headlights, which further help amplify the size of the grille. Despite the overall height of the bonnet being raised, the engineers say they have still managed to achieve their aerodynamic targets (cd of 0.27), which is quite impressive. 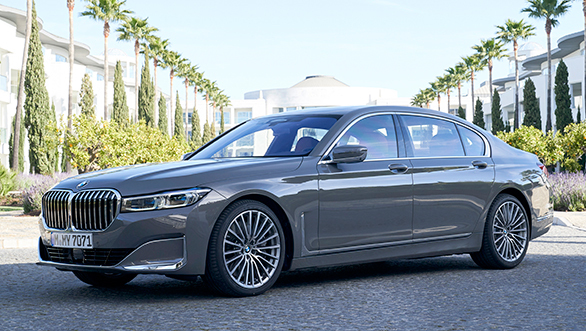 The standard 7 Series (5,120mm) and its long-wheelbase twin (5,260mm) are, both, 23mm longer than their respective predecessors, and raising the height of the bonnet and making it more upright, has resulted in the new 7 Series looking even longer. The bumpers have been redesigned and the front one has larger trims and chrome edging. The air vents placed just behind the front wheels are more vertical (almost 90 degree angle) and extend much further upwards, which is in keeping with the augmented upright stance. They are also said to optimise air flow through the wheel arches. At the back, the tail lights are not only 35mm slimmer, but also have a deeper sculpted shape to give them more depth and a three-dimensional like effect. These lamps are now connected by a thin (six millimetre) full-width light strip that is situated beneath the chrome bar and linked with the DRLs. Just like the front, the rear has a more muscular and contoured look. 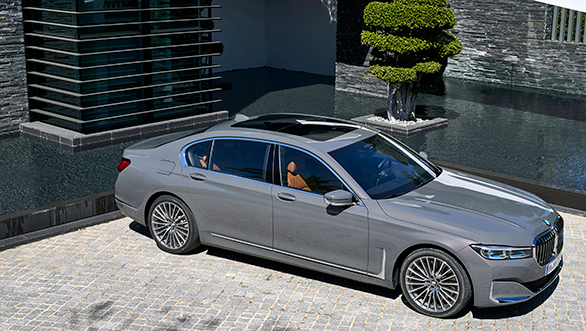 With the mild restyling treatment, the earlier sleek styling of the BMW 7 Series, has become noticeably sinewy and the street presence far more compelling. I am told the Chinese response to the restyling has been most positive, and I think it will get a favourable reaction in India too. The passenger compartment of the 7 Series has always been special, but now BMW has made it even more delightful and enjoyable. It's loaded with additional high-tech features and the quality of materials and workmanship has been elevated to the next level. Everything is covered in rich leather and adorned with the best of woods with fine grains and finishes. The metal trim is tastefully integrated to create a grand, but relaxing ambience. The leather bits, especially on the door pads and seats have double, quilt like stitching, and look stylishly elegant. Passengers are pampered with electrically adjustable seats shaped to provide supreme comfort. 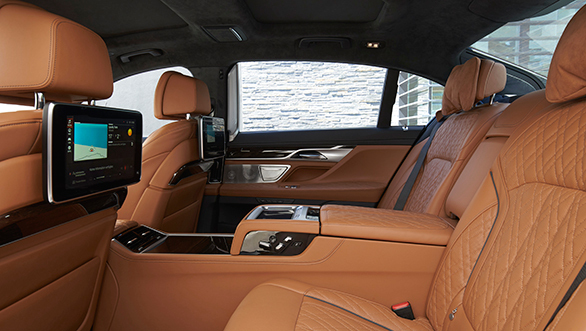 The legroom and space available in the long-wheelbase or extended 7 Series is massive, and the rear seats can also be reclined. And in case you feel like visiting a spa, you don't have far to go. Because both the front and rear seats have massage functions and heating and ventilation and different experience based options of ambient lighting and also a choice of fragrances on offer! The infotainment system now comes with BMW's latest generation iDrive software, and also a digital personal assistant that plays the role of your absent co-driver. Just say 'Hi BMW' and your digital co-driver is ever willing to fulfil your requests, be it adjusting your seats, the climate control temperature or even finding destinations on the navigation system or giving you suggestions for parking. The new BMW 7 Series also has features like automatic soft-door closing, wireless charging pad, gesture control, WiFi hotspot, etc. BMW says that the upgraded hard-drive-based multimedia system which can store 20 GB of data also has an adaptive navigation system that keeps track of the routes you normally frequent and it also has the ability to learn your preferences. Microsoft Office, Skype, etc, have been integrated into the multimedia system and the software controlling the vehicle functions can also be remotely upgraded via the net. BMW engineers have done a lot of work on making the passenger compartment even more silent and peaceful too. The laminated glass in the windscreen and side windows is 5.1mm thicker, enhancing acoustic comfort, especially on long journeys. It is also something that will be appreciated on our cacophonous streets. Additional insulation shields have been put around the rear wheel arches, in the B-pillar and also in some other areas and all this has culminated in a calmer cabin. But as it's more silent, the bit of whine from the large and sticky tyres is more audible too. 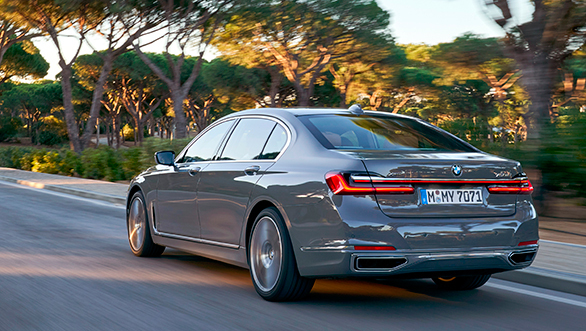 All the engines, and the BMW 7 Series comes with a choice of many, have been tweaked to boost the power output. The most significant increase is in the 750i's V8, twin turbo petrol, which now makes 537PS and 750Nm of torque. The twin-turbo V12 in the M760Li of course generates an immense 593PS and 850Nm of torque. The biggest change is in the plug-in hybrid. The new 745e comes with a six-cylinder petrol engine, whereas its predecessor was powered by a four-cylinder unit. This more powerful engine works in tandem with an electric motor drawing its charge from a new battery with the latest cell technology. All these changes in the powertrain are accompanied by an increase in the all-electric range (58km), which in turn has benefitted this PHEV's (Plug-in Hybrid Electric Vehicle) overall fuel efficiency. It is now said to be 45kmpl as per European test rules, which is really amazing. Yes, one of the most luxurious and expensive vehicles in the world, is also the most fuel efficient. We would love to test its fuel efficiency in Indian driving conditions, and hope BMW brings in this hybrid, which, we have a feeling they will, sometime in the future. The least powerful engine is to be found under the bonnet of the BMW 730d, but even it produces 269PS and 620Nm of torque and gets to 100 in 6.1 seconds. The engines in the new BMW 7 Series, and their state of tune, are actually just of numerical interest, because all of them provide more than enough performance, much of which will hardly ever even be used in India. Of course, the way the petrol V12 and also V8 generate their horses and unleash them, is a joy every enthusiast will delight in experiencing. All variants are mated to an eight-speed automatic that is smart, smooth and swift in changing gears. The all-wheel drive (xDrive) is offered on some variants, with the gearbox channelling power to the rear wheels in other versions. Interestingly, the gearbox maintains close communication with the GPS system, and selects the appropriate gear depending of what kind of road is coming up ahead. So if you are in a long sweeping corner, the gearbox will know this from the GPS system, and avoid shifting to a higher gear mid-way through the turn! And from the little I experienced on our drive of the new BMW 7 Series in Portugal, all these advanced systems work in such a manner, that they actually seem to be fairly good at reading the road, and also, ahem, your mind. The BMW 7 Series is packed with so many smart electronic driving aids, that I am starting to fear that it could be smarter than most people (including me) who will get into its driver's seat. It comes with things like lane departure warning alert and active lane-keeping assistant with side collision avoidance and automatic lane change, collision and pedestrian warning, blind-spot monitor, auto emergency braking, long traffic jam assist, adaptive cruise control, autonomous parking via a reversing assistant, etc. The reversing assistant automatically backs up the vehicle and can manage not only the steering, but the brakes and accelerator too! But honestly, we still have to try out and properly test most of these features. And I do have my doubts if several of them will be useful in India, or work the way they have been designed to. One thing that comes across very strongly while driving though, is that in spite of the 7 Series being long and luxurious and almost limousine like, BMW is fully focussed on its driving dynamics. On the move, it feels far smaller than it is and changes direction with a sense of exigency, you rarely find in such cars. The balance between comfortable ride and responsive handling, is also appreciably good and it all comes down to the base or platform, which right from the beginning has been designed and set up to provide both, comfort and agility. 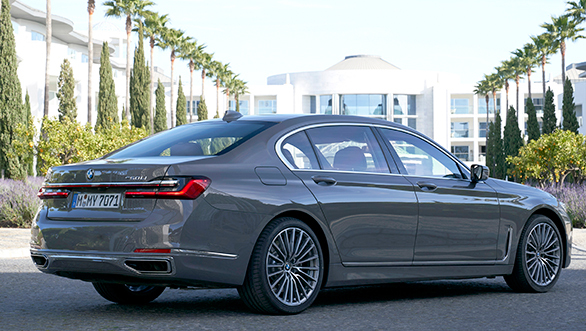 The BMW 7 Series has a twin-wishbone front and five multi-link rear suspension setup. Adaptive, electronically controlled dampers and two-axle air suspension with automatic self-levelling and active roll stabilisation complete the package. The active rear-wheel steering optional, and turns the rear wheels in either the same direction or the opposite direction to the front ones, depending on the vehicle speed and all these combine to present superb handling and grip along with commendable ride comfort. The overall driving experience is beyond expectations to say the least, and the steering, braking, etc, all merit a certificate of acclaim for BMW. Even the ground clearance, which often is an issue in our driving conditions with such cars, should not be a problem, as the air suspension allows the height to be raised by 20mm at the touch of a button. 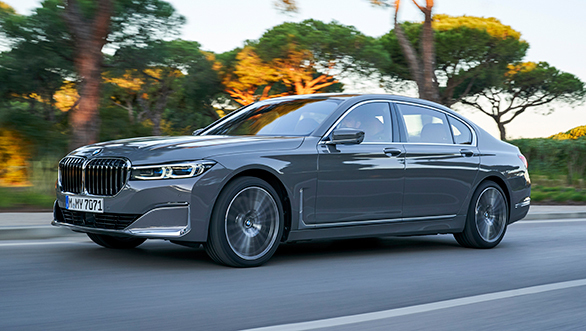 The new BMW 7 Series is quite an extraordinary machine and a worthy rival to the Mercedes-Benz S-Class, for the title of 'Best Car in the World'. Now it has far more eye-catching street presence, drives better than you imagine and the passenger compartment is amongst the finest in the business. Frankly, there is little not to like in it. Other than the fact that you have to be really rich, to afford to buy, and use it. If what it will cost still matters to you, it should come at a price just slightly higher than the present 7 Series.